Sudie Bower Stuart was born on June 30, 1895, in Manchester, in Grant County, Oklahoma, to Marion V. and Susan Elizabeth Allison "Allie" (Starks) Stuart. According to her niece, Sudie and her family moved to Binger, Oklahoma, where she attended school. The enumerator of the 1910 Federal census found the Stuart family in Fern, in Caddo County, Oklahoma. Sudie B. Stuart taught at the Henley school in Klamath Falls, Oregon, from 1917 to 1919. Prior to that, she had lived in Silverton, Oregon. By 1920, Sudie was married and living in Kimberly, Idaho, with her husband, Everett G. Hager (1890-1971). Sudie B. Stuart Hager seems to have resided in Kimberly for the rest of her life, working as a teacher at the junior high school there for ten years before retiring to devote herself to her poetry. Called "a poet of the people and a Solomon of the Soil," (1) she was appointed the third poet laureate of the State of Idaho in 1949, succeeding in that post Irene Welch Grissom. (Ezra Pound was the state's first poet laureate.) Sudie's poetry appeared in Country Gentleman, Farm Journal, and The Saturday Evening Post, as well as many newspapers. 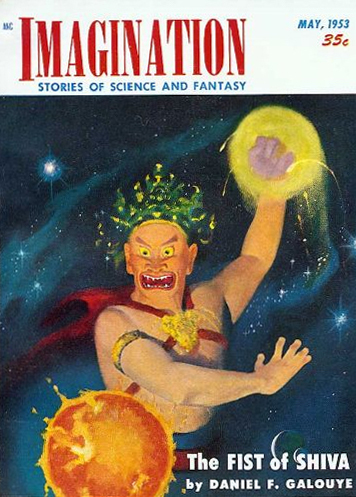 Her only poem for Weird Tales was "Inheritance," in the issue of July 1940. Sudie's poems were collected in Earthbound (1947) and Beauty Will Abide (1970). Sudie Stuart Hager served as poet laureate of Idaho until her death on May 27, 1982, in Kimberly. She was buried at Twin Falls Cemetery, Twin Falls, Idaho. 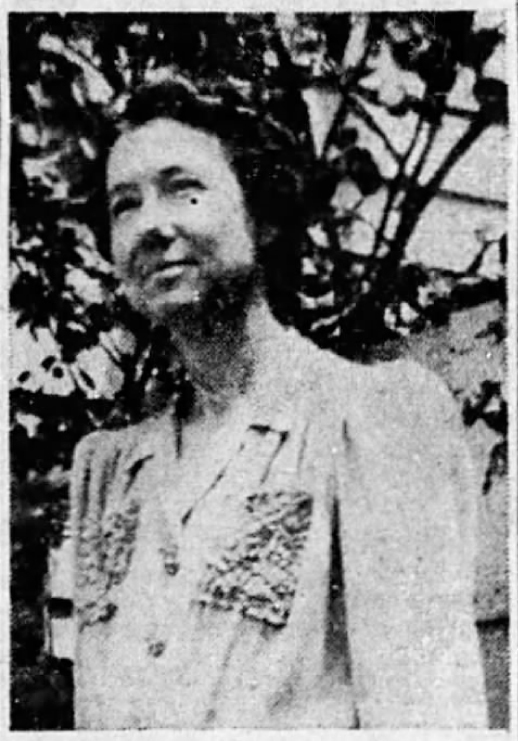 "Poet Laureate of Idaho Is Former Klamath Woman," Klamath Falls Herald and News, February 26, 1949, page 14. "Writers Will Mark Idaho Poetry Day" by Frances C. Yost, Idaho State Journal, October 12, 1950, page 9. (1) From "Writers Will Mark Idaho Poetry Day" by Frances C. Yost, Idaho State Journal, October 12, 1950, page 9. A Swipe from Virgil Finlay and Back Again? Update (Sept. 9, 2018): Now I find that Finlay reused his earlier drawing and seems to have swiped McCauley's drawing for his interior illustration for "A God Named Kroo" by Henry Kuttner, printed in Fantastic Story Magazine, Summer 1954. A year between issues (May 1953 to Summer 1954) is enough for Finlay to have seen McCauley's illustration and to have worked from it for his own rendering, but I'm still not sure this is a swipe. There is definite resemblance of Finlay's second drawing to McCauley's illustration of May 1953, but both are similar to Finlay's first drawing from nearly thirty years before. Also, note that "A God Named Kroo" had previously been printed in Thrilling Wonder Stories, Winter 1944. I wondered whether Finlay's illustration had also been reprinted, so I looked it up. As it turns out, it had not. The artist in the original printing is unknown, and his (or her) illustrations look nothing like those of Finlay or McCauley. So what do we call it? A swipe of a swipe? And who did the swiping? McCauley from Finlay? Finlay from McCauley? Finlay from Finlay? I'm not sure. Another possibility--one that seems surer to me now versus when I first wrote this article in 2017--is that both Finlay and McCauley swiped their pictures from an unknown original source. Whatever the case, it seems likely that, as in the old commercial with Mr. Owl, "The world may never know." Bernard Austin Dwyer is known now among fans of weird fiction as a correspondent of H.P. Lovecraft (1890-1937) of Providence, Rhode Island. I don't know that the two ever met, but I don't have many sources on Lovecraft's biography or voluminous correspondence. What I can say is that Bernard Austin Dwyer, who has largely escaped the investigations of biographers, is a little more known today than he was yesterday. Bernard Austin Dwyer was christened William Bernard Augustine Dwyer--or at least that's the name he claimed on his draft card in World War I. His parents were Philip or Phillip Dwyer (1862-? ), an Irish-born farmer and factory worker, and Mary A. Dwyer (Aug. 1863-? ), a native of New York. We can speculate that her maiden name was Augustine, thus the origin of her son's second middle name, and, by contraction, his assumed middle name. Dywer had a sister, Katherine or Catherine A. Dwyer Sherman (1899-? ), a widow later in life who nursed him when he was sick. He also had a brother, Charles P. Dwyer (1901-1973), possibly nicknamed "Zip." The Dwyer family moved from place to place in New York State. In 1900, they were in Claverack in Columbia County (which may have been Mary Dwyer's native county). In 1905, Olive, in Ulster County, was their home. By 1915 and through 1920, William B. Dwyer was working on the farm in West Shokan, a place evidently within the town of Olive and in the area of the artist's and writer's colony of Woodstock and Bearsville. By 1925, he was calling himself Bernard W. Dwyer, though still working as a farmer, again in Olive. And by 1930, Dwyer had an industrial job working as a polisher in a factory in Kingston. He was then living with his widowed sister Katherine Sherman. In the 1930s, Dwyer worked at the Civilian Conservation Corps (CCC) camps at Peekskill and Cornwall, New York. Described by the Kingston Daily Freeman as a "powerful giant, talented writer and what not," he was a farmer, gardener, woodcutter, and all-around worker in the outdoors. Dwyer was also an artist, a poet, a writer, and the proprietor of Dwyer Sign Shop in his hometown. For a time, there was a place called Dwyer's Corner where his parents lived, worked, and entertained frequent visitors among their family. For a time also, Dwyer was on a live radio program called "Soph and Joseph" with Sophie (Pinkosz) Miller (1910-1997), who also wrote the script. The show was on WKNY of Kingston. Dwyer, who modified his name to Bernard Austin Dwyer, had a brief career as a writer in and for pulp magazines. His only work for Weird Tales, other than his letters to "The Eyrie," was a poem, "Ol' Black Sarah," from October 1928. He also had a letter in Strange Tales of Mystery and Terror. Dwyer died on August 19, 1943, presumably in Kingston, New York. Like his friend by mail, H.P. Lovecraft, Dwyer was forty-six years old at his death, an event that occurred on the eve of the anniversary of Lovecraft's birth more than half a century before. "Quinn's Masterpiece," Dwyer's letter to "The Eyrie" from March 1938, at Wikisource, here. "'A Mighty Woodcutter': Bernard Austin Dwyer and His Possible Influence on Lovecraft" and comments, posted by David Haden on the blog Tentaclii:: H.P. Lovecraft Blog, July 13, 2014, here. 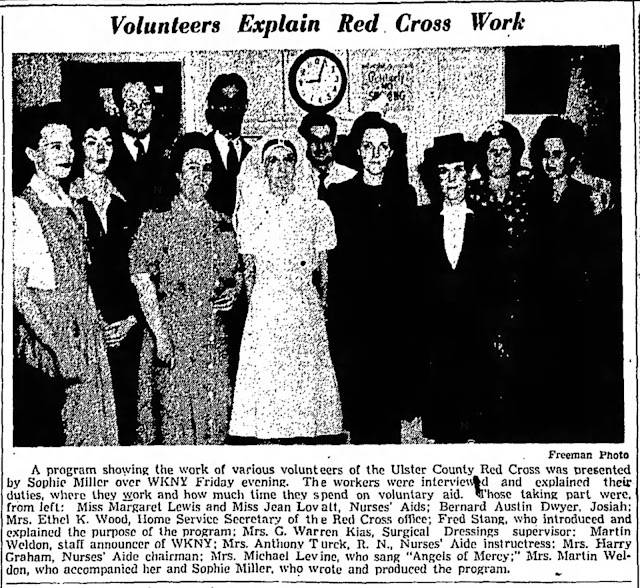 A group photograph of Red Cross workers and others from the Kingston (New York) Daily Freeman, June 15, 1943. Bernard Austin Dwyer is the tall man on the far left. His co-worker in radio, Sophie Miller, is on the far right. A little over two months after this picture was in the Kingston paper, Dwyer was in his grave. Alexander Rice was managing editor of the Davenport (Iowa) Tribune and a boys' secretary and director of the YMCA in Davenport. He also taught vocational school for ex-servicemen after the war. In 1922, he got a job with Neuhaus and Son of St. Louis to take paintings by important American artists on the road for exhibition. Rice, who was an artist himself, would also give lectures on these paintings. As Binny Koras, Rice had poems in Dial, Nation, Pagan, Pearson's, Shadowland, and Survey. His poem "Growing Up," originally in the Rock Island Argus (Illinois) and reprinted in The Literary Digest, The Bookman, and Anthology of Newspaper Verse for 1921, was called by the same article "perhaps the most widely printed verse of 1921." 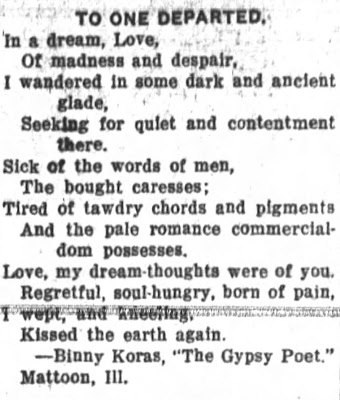 He had one poem in Weird Tales, "For Clytie," in the issue for November 1926. SEVENTAN FELLOWSHIP. Based on the Book of Seveta (Arabic, Seventh Century, A.D.). Missionary for North America, Binny Koras, A.M., Ph.D. He was evidently involved in socialist causes, too, which are, as we now know, just another form of superstition or occult activity. 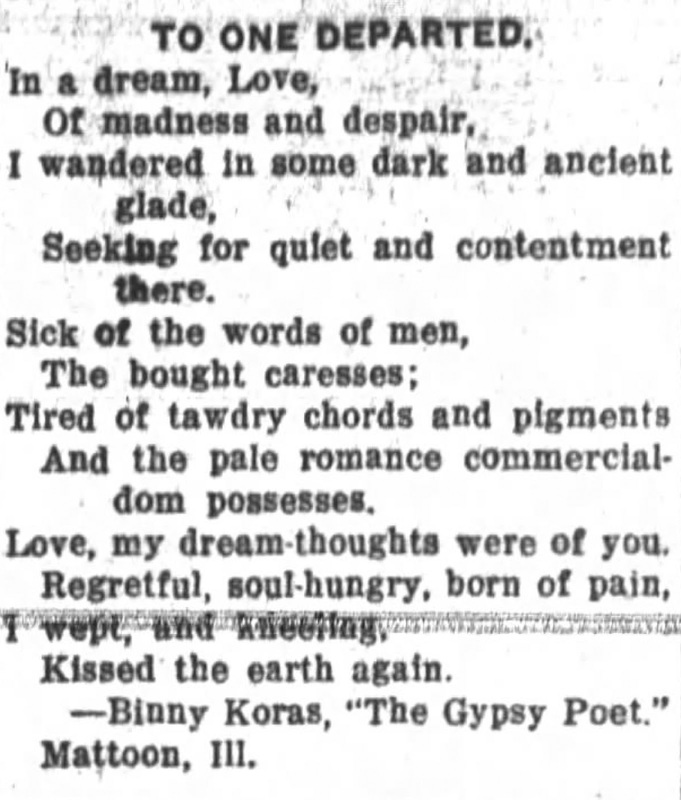 Binny Koras submitted his verse to newspapers from addresses in Davenport, Iowa; Mattoon, Illinois; and St. Paul, Minnesota. His nickname, "the Gypsy poet," may have come from his wandering ways, but he also claimed Romany ancestry. Unfortunately I have not been able to find out anything more on Alexander Rice or Binny Koras, including his dates and places of birth and death. "Alexander Rice Gains Fame for Writing a Poem." The Daily Times (Davenport, IA), Oct. 8, 1921, p. 4. "'Jedediah Tingle' and an Iowa Pet" by Agnes Barton. Des Moines (IA) Register, May 14, 1922, p. 31. [Item.] 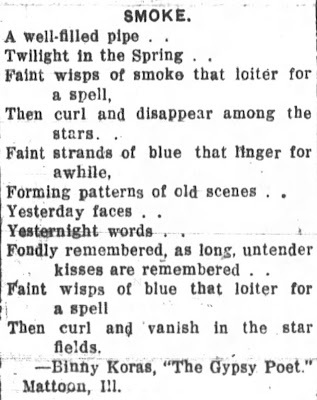 The Dispatch (Moline, IL), July 22, 1922, p. 4. "Alexander Rice in Charge of Art Exhibit on Tour." 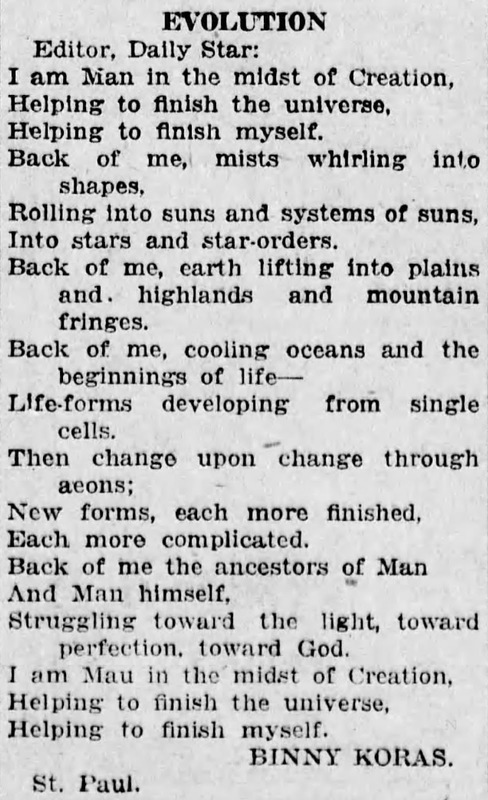 The Daily Times (Davenport, IA), Aug. 16, 1922, p. 7. (1) "'Jedediah Tingle' and an Iowa Pet" by Agnes Barton. 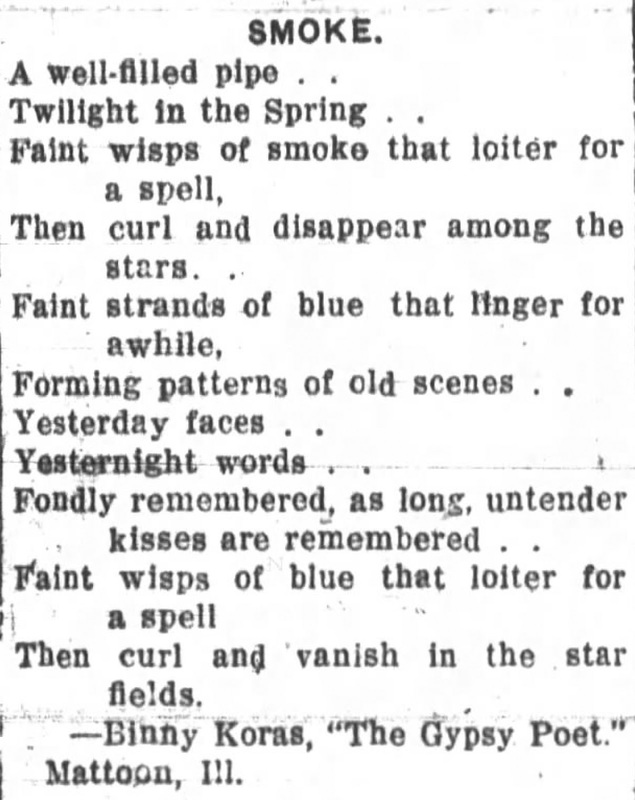 Des Moines (IA) Register, May 14, 1922, p. 31. Gee! But I wanted to grow up. With a pay-day on Saturday. And Don, who went to the Advent church. And Brick Top and Eppie and Skin and Spider. And what "Commggery, wiggery, meggery" means? When I saw him last. Don was with the Rainbow Division when the world ended. What he was going to do when he grew up. "Smoke" from 1922, "Evolution" from 1927, and "To One Departed" from 1922. Labels: Authors, Authors of Australia and New Zealand, Poetry, Who Was . . . ? Sybla Ramus was born on October 3, 1874, probably or possibly in Chicago, Illinois. Her parents were Charles Emil Ramus (1827-1891?) and Sybla Faulds Ramus (1844-1934), who were married in Chicago in 1871 (on Halloween). Charles E. Ramus was a native of Denmark and a veteran of the U.S Army. His wife, whose name was misspelled "Sybilla" and "Sylvia," was born in London, Ontario, Canada. The younger Sybla Ramus' brother was a prominent physician and surgeon, Dr. Carl Ramus (1872-1963), who served in Honolulu, Hawaii, and at Ellis Island in New York. The Ramuses were a musical family. Carl played cello and maintained a string quartet while stationed in Hawaii. Sybla Ramus was a pupil of a Madame Rounseville of Chicago and gave a piano recital at the age of twelve. She also studied under Max Bendix (1866-1945) in Chicago; Arno Hilf (1858-1909) at the Royal Conservatorium of Leipzig; Otakar Ševčík (1852-1934) at the Prague Conservatory; and others. She played piano, violin, and viola, and was herself a teacher at the Chicago Musical College (ca. 1899) and the American Violin School, also in Chicago. Sybla Ramus played in St. James' Orchestra at St. James' Parish in Chicago. She also wrote the libretto for an opera, Armand, with a musical score by Gerard (or Gerardo) Carbonara (1886-1959), published in 1921. Her Girl Friend, a comedy drama in three acts, from 1923, was also a product of her pen. Her lone story for Weird Tales was the three-part serial "Coils of Darkness," printed in the issues of February, March, and April 1924. As a musician and a former Chicagoan, she may have been in contact with Farnsworth Wright, who was a music critic in Chicago, though not yet the editor of Weird Tales when her story was published. In addition to Chicago, Sybla Ramus lived in Lincoln, New Mexico, with her mother and brother (1900), and in New York City with her mother (1915, 1920, 1925). She died in January 1963 at the age of eighty-eight. "Dr. Carl Ramus (1872-1963) Physician and Surgeon," a biographical sketch of Sybla Ramus' brother, at the website of the National Park Service, Ellis Island, here. Biographical highlights for Dr. Ramus at a website here. Bertrande Harry "Bert" Snell was born on June 6, 1882, in Fort Plain, New York, to Jacob and Mary Snell. He graduated from Parish High School in 1898 at age sixteen and went to work as a Morse code telegrapher the following year. Snell worked for railroads in Pennsylvania for many years before moving to Syracuse, New York, in 1917. He spent the rest of his working life with Western Union in Syracuse. Snell was a poet and had his verse in various newspapers over the years. He wrote three poems published in Weird Tales, "Starkey Strang" (Aug. 1926), "Vampire" (June 1929), and "In the Valley" (Dec. 1929). I wonder if Snell knew Lee Brown Coye (1907-1981), who also lived in Syracuse for many years and who was also a railroad enthusiast. Bertrande H. Snell started as a columnist with The Post-Standard of Syracuse on January 13, 1945. His popular column was called "Just Around the Corner," and he kept it up until his death. Snell's last column was in the typewriter when he had a stroke in June 1949. Taken to the hospital, Snell died on June 26, 1949, and was buried at Pleasant Lawn Cemetery, in Parish, New York. He was sixty-seven years old. "In the Valley" (Dec. 1929). 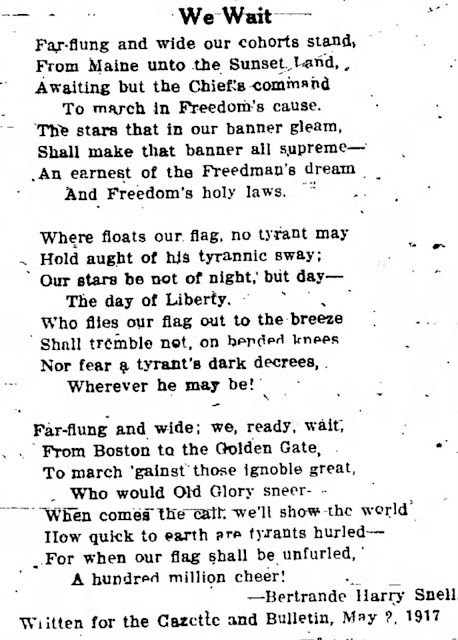 In the centennial year of the American entry into the Great War, here is a poem from Betrande Harry Snell. 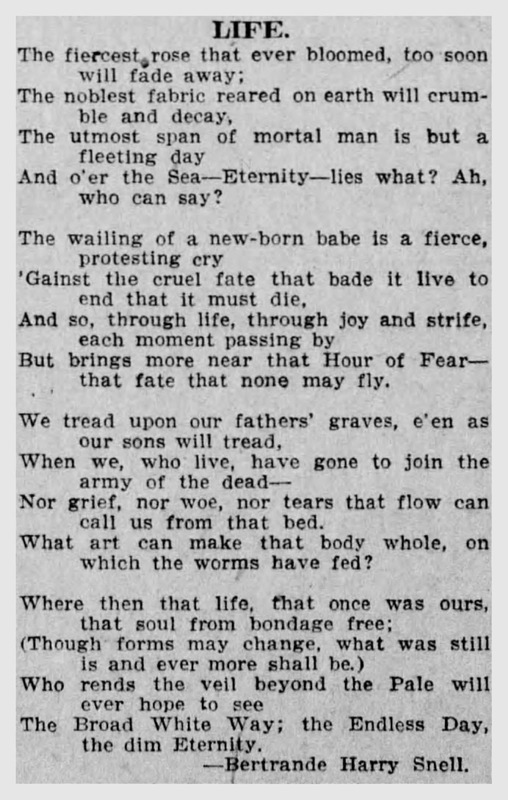 And for Easter, a poem on life and death, from 1916. Snell also wrote an acrostic poem to a fellow poet, "To Mahlon Leonard Fisher," dated May 9, 1914. The concept of the zombi(e), like much of our culture, was brought to America aboard a slave ship. The word is African, the idea is African, and the culture in which zombie-ism in America developed is African. Once here, zombi(e)s evolved from perhaps one common original to a number of different species. The speciation of zombies--the zombiation of the title here--seems to have happened on islands of African-slave culture, separated from each other by the waters of the Caribbean Sea and the Gulf of Mexico. In Martinique and other smaller islands, the concept was of the zombi, an evil spirit who creates discord in the night. In Louisiana, it was Li Grand Zombi, the great serpent god and perhaps the closest to the original African concept of zombi. And in Haiti, it was the zombie we know today, the walking dead, a slave to some external agent. Coming from a common origin, zombi(e)s in America, evolving in separate island habitats, became separate species. For whatever reason, the undead zombie of Haiti proved to be the strongest or most adaptable of them and has spread throughout our culture and throughout the world. Author William B. Seabrook (1884-1945) appears to have been the first to describe the zombi(e), species undead. His reporting from Haiti, published in newspaper accounts in 1928 and issued in book form in The Magic Island in 1929, is sober and evenhanded. It doesn't appear to be sensationalized. I think we have three choices when it comes to Seabrook's writing: First, to consider that he was telling the truth. Second, that, though he may have worked from a kernel of truth, he embellished or exaggerated stories of zombies for the reading public. Or, third, that he made it all up himself. I think we can discard the third possibility. The tone of his writing suggests the unlikelihood of the second possibility. That leaves the first possibility, namely, that he reported more or less truthfully on what he heard, saw, and experienced for himself. That would mean that stories of zombie-slaves in Haiti were true, or at least true to the people who passed them on to Seabrook. I haven't found anything to contradict any of that, and I think we have to conclude that Seabrook reported the truth or something close to the truth as he saw it and, consequently, that he was the father of zombies in America. Seabrook's account of zombies in Haiti, "Dead Men Working in the Cane Fields," opens not on the island of Haiti, but on a smaller island, Île de la Gonâve, located in the Gulf of Gonâve, west of the capital city, Port-au-Prince. Although it is the largest of the islands in the waters of Hispaniola or Santo Domingo, Île de la Gonâve is dry and barren, a poor place to live or to try to make a living. William B. Seabrook visited the island in 1928 and interviewed a prominent local citizen, Constant Polynice. It was Polynice who first told Seabrook about zombies and who first showed him zombies at work in a cotton field on the trail to Picmy. Seabrook described them in various terms, saying among other things that they were "like automatons." Constant Polynice also told his American interlocutor a story of zombies working on mainland Haiti, in the "big cane season" of 1918, when the Haitian-American Sugar Company--Hasco--"offered a bonus on the wages of new workers." A man named Ti Joseph took advantage of that offer by recruiting what Polynice said were zombies. In Polynice's telling, the zombies escaped in the only way they can escape, and Ti Joseph met a fitting end. The point of all this is that zombie-ism in Haiti seems to have been a response either to economic hardship, as on Île de la Gonâve, or economic opportunity, as with Ti Joseph and his work for Hasco. It was not capitalists who made or exploited zombies, but other Haitians, black Haitians for whom the affair of zombie-ism was their own. As Lamercie, the overseer of the zombies chopping cotton on the trail to Picmy, said to the American Seabrook, when it comes to zombies, "Z'affai' nèg pas z'affai' blanc"--the affairs of blacks are not the affairs of whites. So the first accounts of zombies as the undead--the first of the firsthand accounts--came not only from an island but also from an island off the coast of an island. As with the evolution of any new species, zombies as the undead came about through (literal) isolation. Diseases, too, often develop in isolation, often, by our experience, in tropical or sub-tropical fastnesses, where they jump from an animal host to a human host with little notice. HIV/AIDS, which has done such harm in Haiti, is an example. (1) These diseases may operate at low levels for decades before being transmitted to larger populations, after which point they proliferate, sometimes exponentially, becoming in the process plagues or pandemics. That was the case with HIV/AIDS, which claimed its first known victims--known in retrospect, that is--in the 1950s. The same process seems to have occurred, on a far more trivial scale, with the concept of the zombie. Purely by coincidence, the first zombies caused by disease--zombies in retrospect, that is--also appeared in the 1950s, in Richard Matheson's science fiction novel I Am Legend (1954). These were scientific zombies, caused by disease, moving in hordes, and always seeking to infect the uninfected. In short, they were a plague--or pandemic--in human form. George Romero gets the credit for the first movie--Night of the Living Dead (1968)--showing zombies as we know them today. (It might be more accurate to say that Mr. Romero invented zombies as we know them today.) But two years before, in 1966, Hammer Films released The Plague of the Zombies, a movie far less well known today, but perhaps equally important or more important in evolutionary terms. 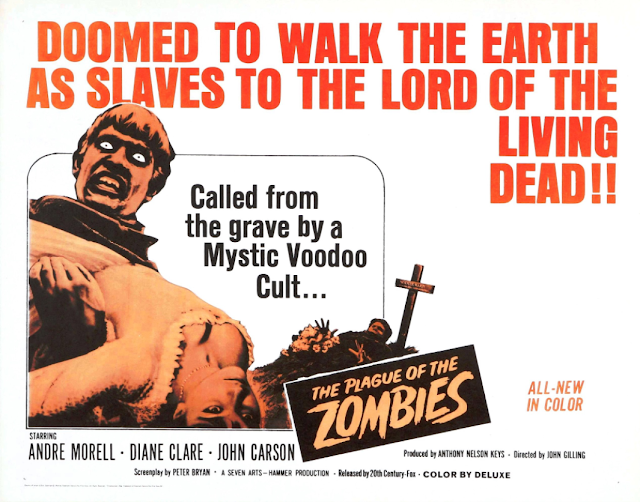 I have never seen this movie, but by description, it was or may have been the first to show a zombie plague and the first to show threatening zombies rather than harmless zombie-slaves. In fact, The Plague of the Zombies seems to have been a bridge or the bridge between the harmless Haitian zombie-slave (i.e., what I have called the Seabrook zombie) and the lethal scientific zombie horde as in Night of the Living Dead (i.e., what I have called the Matheson-Romero zombie). The bridging effect is made obvious in the movie in that there seems to be a combination supernatural/scientific explanation for its zombies. There is also a zombie-maker who has been to Haiti and has returned to his native Cornwall, carrying zombie-ism from one population to another and from one island to another, where he puts them to work, as Ti Joseph put his zombies to work, this time in a tin mine. Because I haven't seen the movie, I don't know the answers to some key questions: How exactly are the zombies in The Plague of the Zombies threatening--are they murderous or cannibalistic? How are they made? 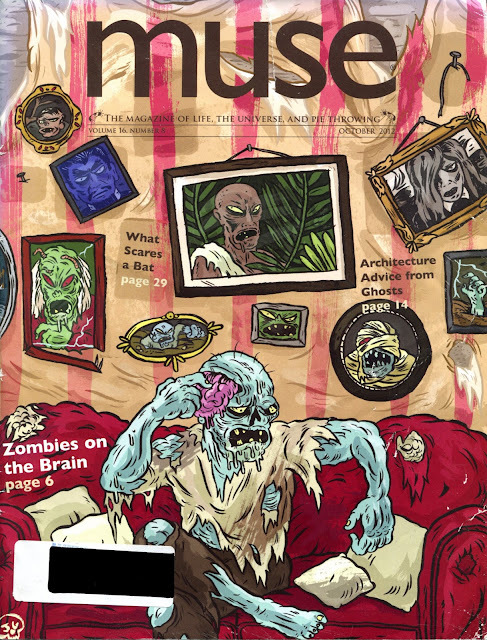 How exactly are they a plague--does the disease of zombie-ism spread from zombie to person somehow? And how exactly are the zombies destroyed? Curiously, The Plague of Zombies is set in 1860, more than two generations before William Seabrook's trip to Haiti. A long time ago, I read of the concept of the meme, a sort of gene of culture that is propagated, like genes, through a population. Zombies and zombie-ism can be interpreted as memes. As in the evolution of a species, they developed in isolation. (Evolution is defined as a change in gene frequency.) As with any successful species, they have shown themselves to be well adapted for survival. Like a pandemic or an invasive species, they have proliferated in a host or in an environment not like their original host or environment, one in which there are no natural controls on their populations. So what will be the controls on zombies and zombie-ism? Or will they be uncontrolled and continue to adapt and proliferate in our culture? If zombies are, as William Seabrook described them, like automatons, will they simply evolve into a different form, that is, into the form of the robot-zombie, as on the graph of the uncanny divide? Will they cross over from the world of fantasy (or at least allegory) into the real world? And will they eventually overwhelm us, as so many people fear, once robots reach a technological singularity? (1) Oddly enough, the origin of HIV/AIDS in humans coincides roughly with the American occupation of Haiti, though HIV/AIDS originated in Africa and is not supposed to have reached the New World until after World War II. The first known victim of HIV/AIDS died in Africa in 1959. Blogger and "monster scholar" Jeanette Laredo, a graduate student at the University of North Texas, has another explanation for why people--young people in particular--are drawn to the idea of a zombie apocalypse. "At their core, zombies represent our fear of becoming part of a homogenous mass, our fear of conformity," she says. "That applies especially to teenagers, because they're struggling with that. They want to be 'in,' but at the same time they want to be themselves." It seems to me that Dr. Laredo (what a great name for a professor in Texas) has drawn her six-gun and shot the prevailing academic "narrative" full of holes, as an ultimate conformity is one of the end-points of the leftist-socialist-statist program. It seems to me also that the author Doug Stewart seems to recognize the threat represented by conformist hordes, another feature of that same program. The upshot of all of this--of all of my series relating to zombies, going back to January--is that the leftist attempt at a theory of zombies in favor of their own program falls apart upon examination, as all of their theories eventually fall apart. But that's enough of all of it. I have beaten this undead three-legged horse enough. 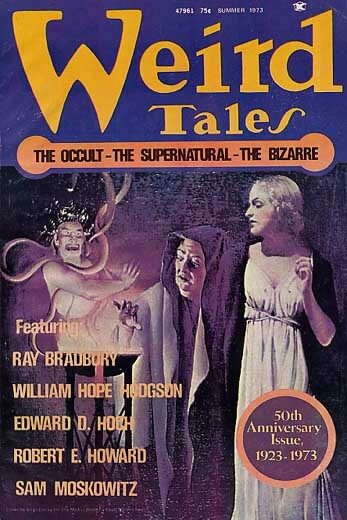 I have one more entry on zombies, then I'll get back to biographies of the writers and artists who contributed to "The Unique Magazine," Weird Tales. (New York: St. Martin's Griffin, 2011), 176 pp. I don't think I have to remind anyone at this point that those "European oppressors" were, first, feudal-statist overlords, afterwards, leftist-statist overlords. Contrary to the most fervent hopes of American academia, they were decidedly not capitalists. Ms. Vuckovic again brings up a good point, that zombie-ism is, at its heart, about a loss of freedom, humanity, and individuality. The modern state, whether socialist, communist, fascist, or nazi in its permutation, seeks to reduce its populace to interchangeable (and highly dispensable) ciphers, essentially to zombies, hence, I think, the fear of zombie-ism in the world today, at least in a large part. Two more points: First, Jovanka Vuckovic also points out in her book the sensationalism of zombie stories of the 1920s and '30s. In my research, I have sensed the same thing, that there may be more sensationalism than reality in those stories. I wonder how much of the beginning history of zombies in America was true and factual and how much of it came from the imagination--or at least the exaggerations or interpretations--of William B. Seabrook. Second, she writes about an author I hadn't encountered before: Captain John Houston Craige (ca. 1886-1954) of Pennsylvania. Like Arthur J. Burks, Captain Craige served with the U.S. Marine Corps in Haiti during the American occupation. And like William B. Seabrook, he wrote about his experiences and observations in non-fictional form. His books included Black Bagdad [sic]: The Arabian Nights Adventures of a Marine Captain in Haiti (1933) and Cannibal Cousins (1934). According to the website Encyclopedia.com, Captain Craige read up on Haiti in the works of "the French historian Moreau de Saint-Méry (1750-1819), the Haitian historian Thomas Madiou (1814-1884), and the Haitian writer Louis-Joseph Janvier (1855-1911), among others." The source is suspect, but those authors might be a good place to start in pushing the origins of zombies as the walking dead to before 1928. For example: Moreau de Saint-Méry used the word zombi, meaning revenant, in writing, in French, in 1792. Knowing that leads me to the book White Zombie: Anatomy of a Horror Film by Gary D. Rhodes (2001), an even more thorough and scholarly book than Zombies! 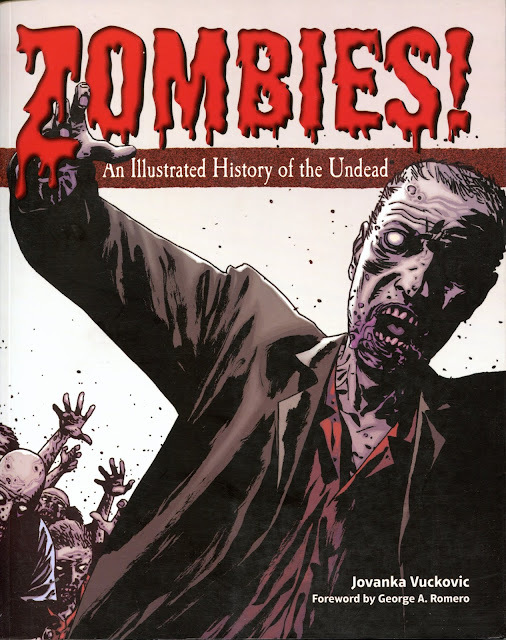 (1) In fact, Dr. Rhodes' book might be the last word on the history of zombi(e)s in America. It also includes a tantalizing discussion of H. Bedford-Jones' novel Drums of Damballa (1932) and its sources, which are supposed to have been documents or materials, brought from Haiti to the United States in 1803, that mention zombi(e)s. I wish we had more on this. There is no telling what those materials might reveal. One thing all of this reveals is that some American academics, like Dr. Rhodes, do their homework, and some--too many to name here--apparently don't. (1) That book reveals, surprisingly, that there is a connection between zombie-ism and the consumption of Jamestown weed, also called jimsonweed or Datura, in the form of "concombre zombi," a concoction for inducing the condition in an unsuspecting person. Once again, jimsonweed raises its (seed)head in relation to the supernatural and weird fiction. (Oxford, UK: Basil Blackwell, 1989), viii+ 239 pp. 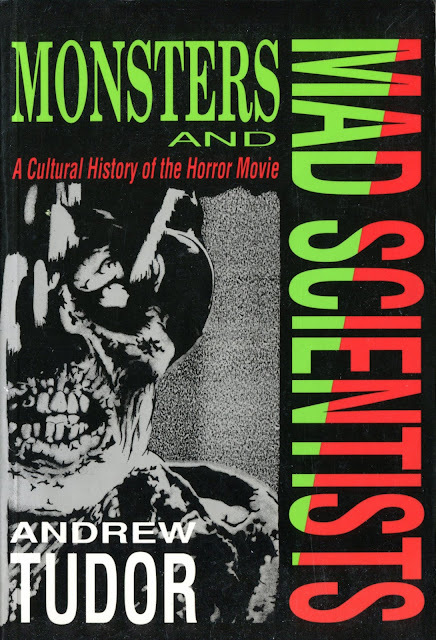 When Monsters and Mad Scientists was published, Andrew Tudor was Senior Lecturer in Sociology at the University of York. He was film critic for New Society from 1975 to 1982, head of his university Sociology Department from 1988 to 1995, and head of its Department of Theatre, Film and Television from 2006 to 2010. He is now retired. Again, as in Caligari's Children, there is the implication that the zombie apocalypse movie appeals most to viewers who are already living in a state of despair, extreme alienation, or at the ends of decadence, and that those viewers may also be essentially nihilists or extreme anarchists, not in a political sense, but in a philosophical and ultimately spiritual sense. Again, the zombie apocalypse seems to be a positive fantasy for those who would like to see the world destroyed or who, in their descent into "psychosis," would like to take the whole world down with them. There is a good deal more on zombies in Monsters and Mad Scientists, too much, really, to discuss here but all of it piercing in its analysis and fascinating in its insights. It's clear that Andrew Tudor is from a previous generation of scholars, those whose work seems to be unpolluted or undistorted by Marxist interpretation. Now, in 2017, it may be too late for anything like it. (1) This is in no way to imply that Andrew Tudor is or was leftist in orientation. (Oxford, UK: Oxford University Press, 1980), 307 pp. S.S. Prawer (1925-2012) was Taylor Professor of German Language and Literature at Oxford University and a Fellow of The Queen's College. His book Caligari's Children is scholarly but accessible. 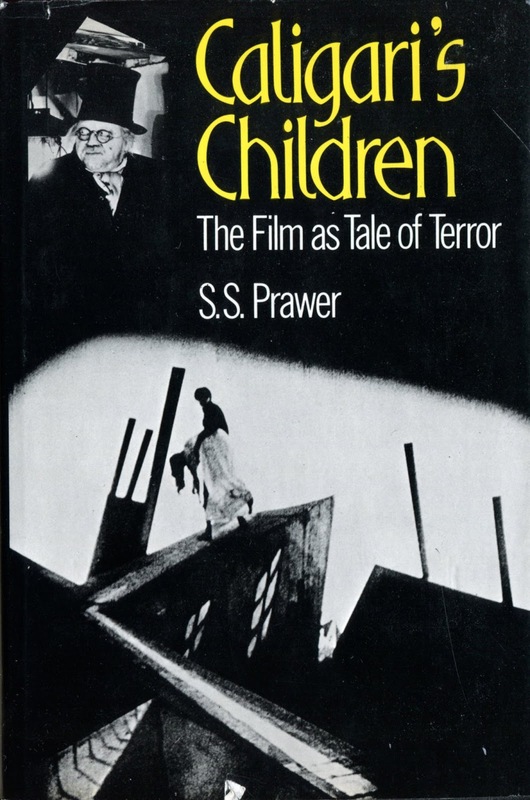 I'm happy to say that Dr. Prawer was a fan of movies. His book is the first scholarly work in my own library on zombies. I have written before that the most basic interpretation of the zombie apocalypse is that it lays bare our fallen state as human beings. I don't think you really have to go beyond that, especially not into the realm of politics or economics, to recognize meaning in this story. I would argue on the other side that, although we are fallen, we might still be redeemed: we have that possibility within us. So is Dr. Dillard saying that there are viewers who have given up on the possibility of redemption? Who believe that our falling will not be counteracted by any rising? Is the viewer who prefers the zombie-apocalyptic story, then, a pessimist or a nihilist, a person living in despair or in a state of extreme moral lassitude or decadence? And if so, and if that viewer is actually countless millions of viewers, is not the zombie an apt monster for our time?